Though the current political rage in the West is blind disruption, I am the first American appointed by the Vietnamese government as an artistic advisor to a Vietnamese arts organization, a breakthrough diplomatic moment. My role is to assist the development of the Hà Nội New Music Ensemble, in the long term process addressing the international profile of the country through new music. After a dozen years of going in and out of Asia, I now have a vantage point about Việt Nam, both country and war, which I hope will continue to amplify our collective American memory. What sort of American truth serum do we need to remember Việt Nam? Allow me to start by pointing out the painfully obvious observation embedded in my question. Lost in translation, this necessity is often discarded, if it is considered at all, as an annoying editorial symbolic detail. Something of no consequence. Vietnamese, despite its numerous and maddening phonetic tones, is a mono-syllabic language. My linguistic reality, my fact? I’m now comfortable spelling the name of the country correctly. 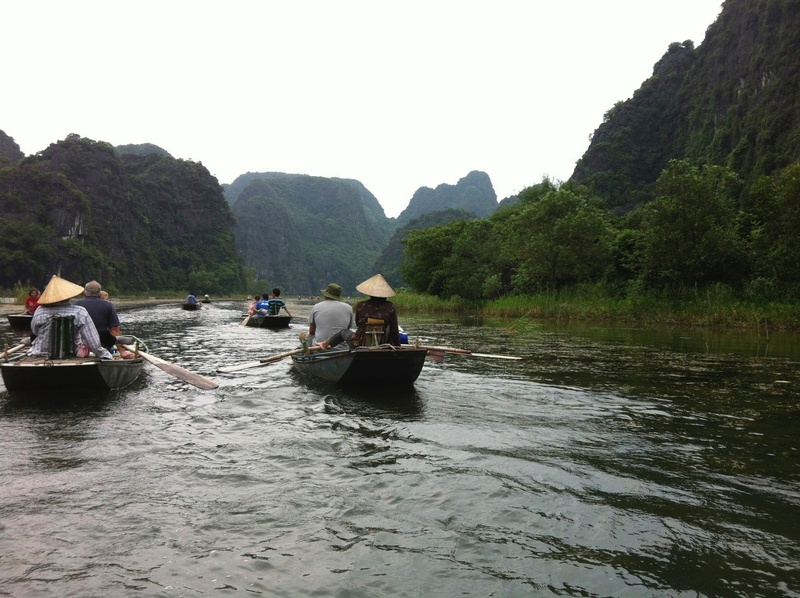 The quiet beauty of a gliding boat ride in Tam Cốc in Việt Nam. Memory is a contradictory reality. How do we remember? Do we choose what to remember? Can we change what we remember? If you look carefully at these three questions, you might notice something familiar. I’ve used one word – remember – to suggest past, present and future. It’s one way to begin explaining the major difference between East and West. In the East, there is no conjugation of verbs into three tenses. There is only a global tense that is modified. By focusing on one word – remember – I’m hoping my questions bring you closer to this elusive Eastern thought process, the conceptualization of time as a simultaneity. For me born speaking a Western language, approaching this Asian perception of time is an essential ingredient of my American truth serum for Việt Nam. Continuity is the lifeblood of language. If you possess only a limited vocabulary, you can’t chart an effective strategy. Fits and starts will eventually become fixed and concrete, offering no flexibility and no sense of achievement. Because I see Việt Nam as a country does not mean I have forgotten it was a war. I’ve diligently studied numerous viewpoints of the history of East Asia and Southeast Asia, concurrently examining the vanity of French and American ambition and involvement. But all of this historical scaffolding was just the tightening of a vein before injecting myself with the most potent truth serum I could find about Việt Nam. 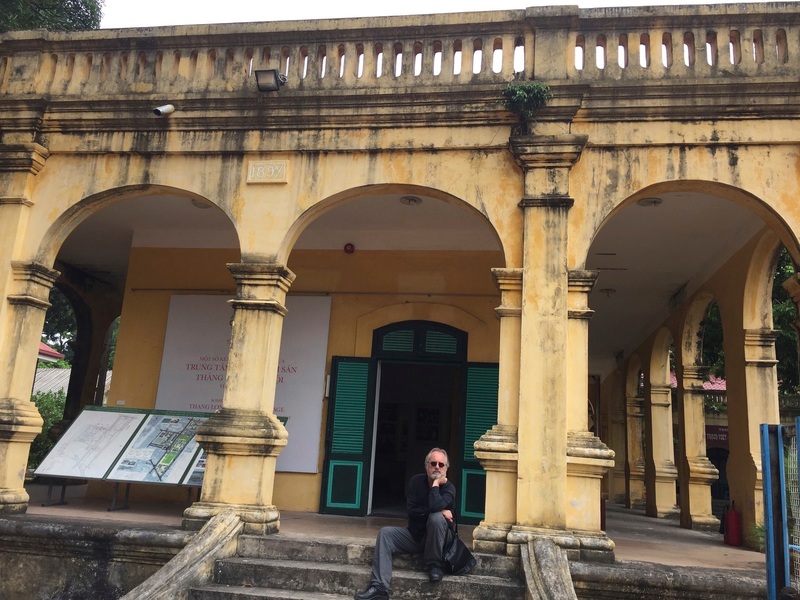 Thank you to my wife Jan, who caught me having this emotional “What the hell happended?” American moment at the Citadel of Hà Nội. I admit I am attracted to ambitious projects and dreams, which have helped me build the pathway to making a difference in this life and with the lives of others you encounter. Việt Nam’s impact on 20th century history is one of the most extraordinary I’ve ever experienced, and requires considerable research to grasp. I’m still learning. 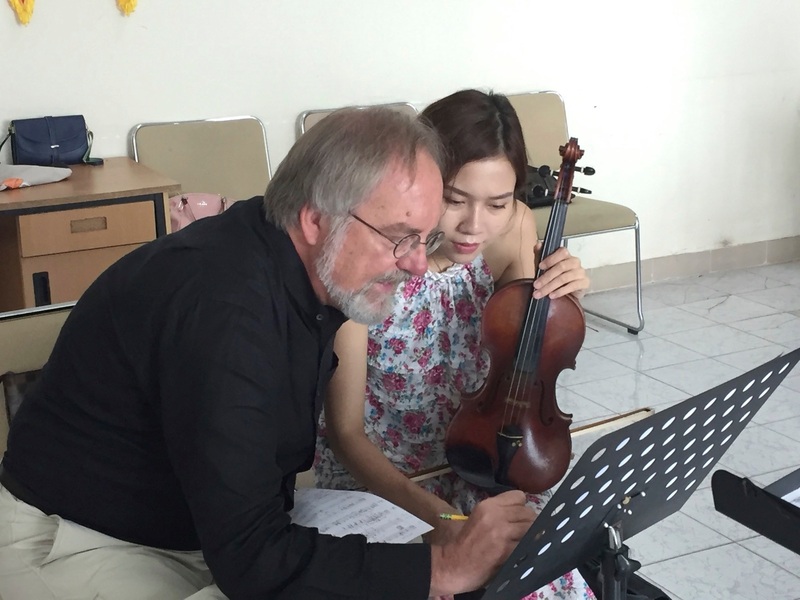 Counting in Vietnamese helps me work with violinist Vũ Khánh Linh. The overall theme of my blog is answering the question posed to me in various forms for over thirty years. How do I create a concert program? In working with the Hà Nội New Music Ensemble, bringing my thirty plus years of experience to the task, I’m inspired by sorting out the layered complexity of their cultural narrative. And I have learned through long term experience with Việt Nam, be careful what you wish for if you believe disruption is the best way forward. In the aftermath of destruction, you’ll find that temporary solutions often become permanently fixed in a national mindset, which might well yield various levels of toxicity. So not only do Americans need a truth serum about Việt Nam, the Vietnamese need a truth serum about themselves. In new music, this means they have to come to terms with France, with the world of Debussy, Ravel, Messiaen and Boulez, which this almost fluent French speaking American is happy to animate. On a Hà Nội side street the temporary becomes the permanent with the ghost of France visible. Growing up in Los Angeles helped me understand the experience of refugees. Hollywood, as Meryl Streep recently reminded us, is a place of people from someplace else. That certainly was true when my mom and her two sisters, all from Minnesota, were waitresses at various Golden Era Hollywood restaurants (20th Century Fox Studios, Chasen’s, Armstrong Schroeder, House of Murphy, Burbank Studios and, for good measure, a best friend at MGM Studios). And being inspired by classical music meant that European refugees would play a direct role as teachers in shaping my personality. And so I want to share with you the continuity of my life, and how I can use that continuity with my Vietnamese friends to bring them, after much hard work, to world class excellence. It’s a question of continuity for all of us. And it is by establishing continuity that Việt Nam will go from being a war to being a country, in terms of how I can make a difference as the artistic advisor to the Hà Nội New Music Ensemble. Let me start with Igor Stravinsky, Arnold Schoenberg and Béla Bartók. They form a significant foundation of Western new music, though we continue to work on the rest of the house in their honor. And Jan and I are happy to be connected to them all with the best friends of our extended family. Inspiration does not sustain itself over your lifetime by accident. 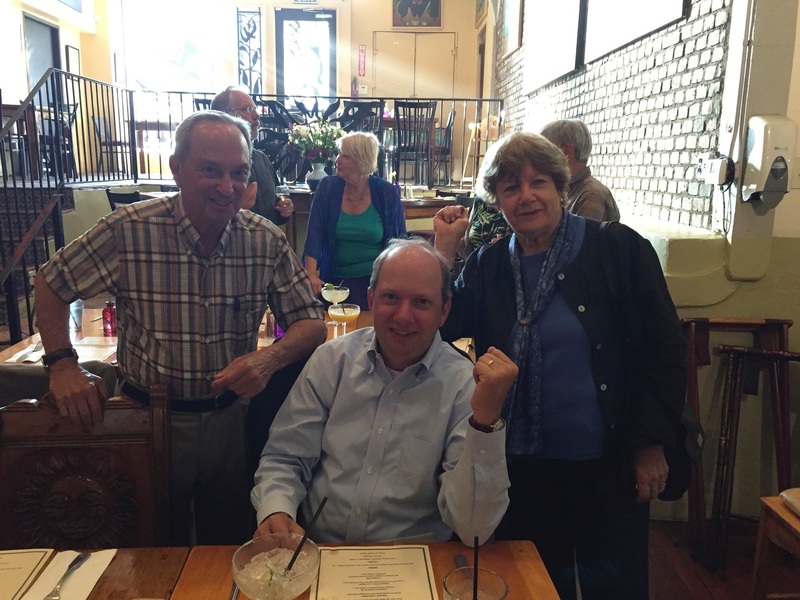 Ron, Randy and Barbara Schoenberg at my 60th birthday party on Olvera Street at Las Golondrinas in Los Angeles. We were fortunate this holiday season that many friends from out of town came to visit us at our Pasadena home, friends from México City, New York City, Hà Nội and San Francisco. These visits allowed us to cook up a few storms, entertain a lot, and reconnect with our friends. In other words, continuity. 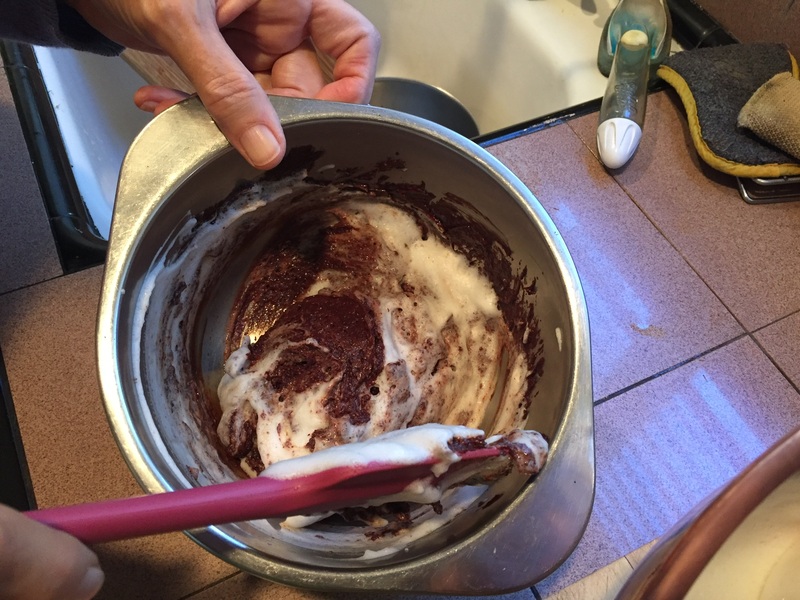 Cooking for friends is a great joy! 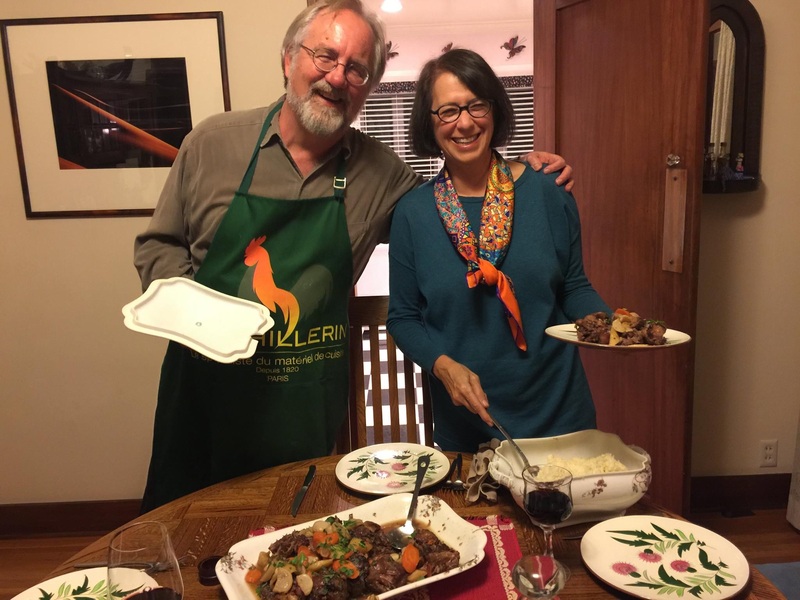 Here we’re serving Beethoven’s favorite of oxtails to a party of Bill Kraft, Joan Huang, Nguyễn Minh Nhật, his mom Hằng and Ricardo Gallardo and his daughter Elena. 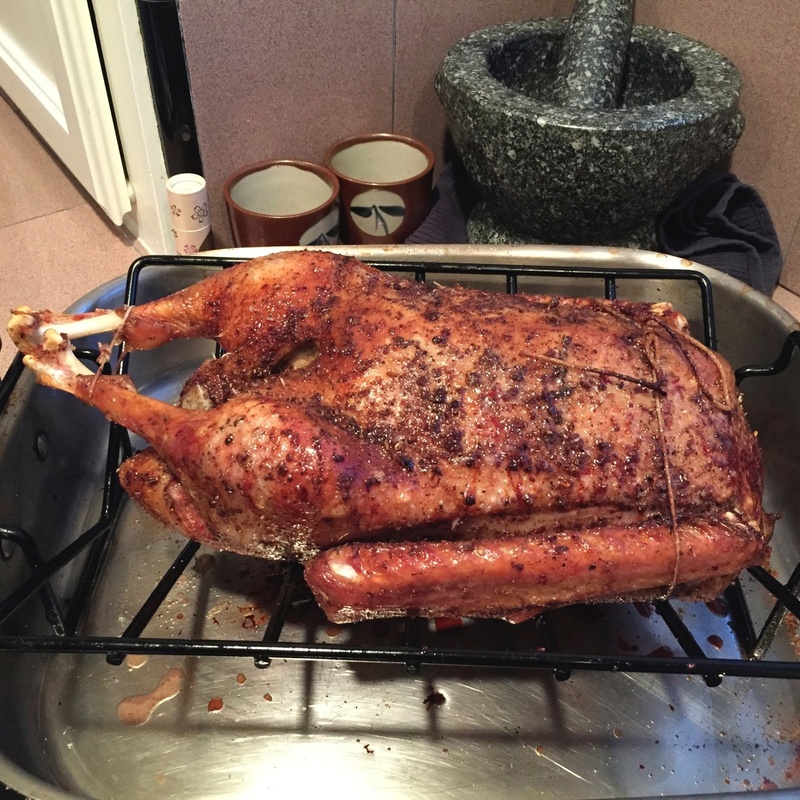 Memories of Budapest as I roast a goose for Kate Akos and her husband Harry Jacobs. 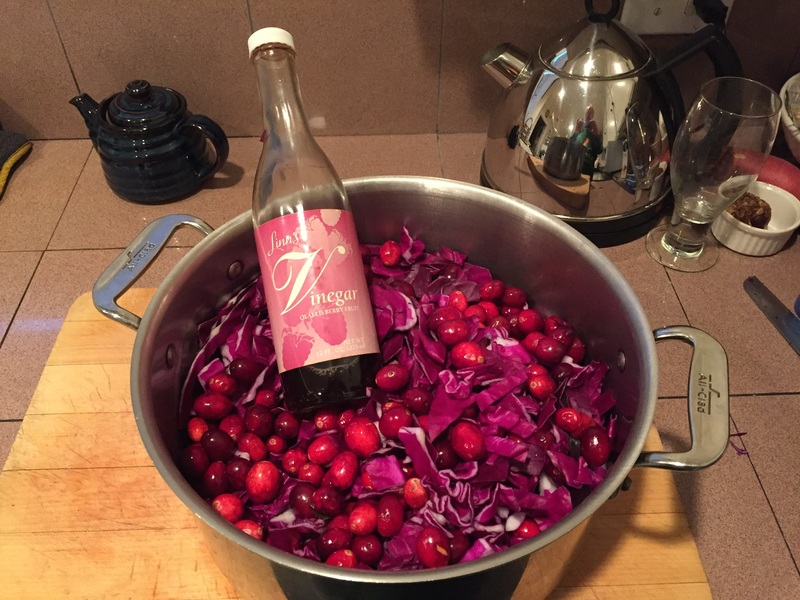 Red cabbage, cranberries and California fruit vinegar for Hungarian tastes. God bless French cuisine! A chocolate mousse with green Chartreuse and a brioche is light and yummy after roast goose. The music of Béla Bartók holds a special place in any musicians’ development. You have a life as a performer before Bartók and then your life after Bartók. There exists an entry level intimidation that I’ve frankly found universal among all players. The fear factor is genuine, as his arch form structures guarantee a grab-you-by-the-throat ending, whether slow or fast, inspiring us all. His music always feels inevitable and remains risky on-stage (which will be true for any performance). My favorite violist Jan Karlin and my favorite violinist Kate Akos. I like new characters. Jan and I met Kate Akos at Tanglewood in 1979 and have remained best friends ever since. She enjoys an impressive resumé of administrative success around the United States, from Detroit to Philadelphia to New York City until she finally settled in San Francisco. We met her as an accomplished violinist. She was Jan’s Maid of Honor at our wedding. Kate’s musical Hungarian pedigree is beyond impeccable. It’s downright inspiring. Kate’s father, the late Francis Akos, was a member of the Chicago Symphony Orchestra for over 40 years, brought into the orchestra by Fritz Reiner. He was retired with the honor of an emeritus member. For starters, Francis studied in Budapest with Béla Bartók and Zoltán Kodály. Bartók the pianist asked Francis to turn pages for a new piece by Bartók the composer, the challenging Sonata for Two Pianos and Two Percussion. Bartók said he needed a page turner he could trust. Let that sink in. WOW. Can you imagine the reaction of my inner voice hearing my pianists this autumn in Hà Nội say they wanted to learn this piece? They had no idea of our personal connection to the work and obviously I’m anxious to get to work on this next season. Am I already hearing Bartók from Việt Nam? Continuity. My wife Jan also studied with Eugene Lehner of the Kolisch String Quartet, which gave world premieres from memory of quartets by Schoenberg, Berg, Webern, and Bartók. Kate and I remember rooting for Jan’s 1979 Tanglewood quartet performing Bartók’s String Quartet No. 2 with Leonard Bernstein and Seiji Ozawa in the audience. Her quartet performance stormed the barn, impressing these luminaries and confirmed what a tremendous musician Jan was, all those years ago. The opening of Bartók’s String Quartet No.6 was written for Eugene Lehner, her mentor. Let that sink in. Another WOW. Obviously Bartók is a big part of our musical and personal life, and Kate and Francis made us feel at home sharing their experiences like a musical family heirloom with us. We are forever grateful at hearing their Hungarian memories. The Kolisch String Quartet: Felix Khuner, 2nd violin, Eugene Lehner, viola, Benet Heifetz, cello and Rudolph Kolisch. Allow me to abruptly edit back to the Hà Nội New Music Ensemble to keep my story of continuity in focus and germane to the sound world of Bartók. One serious technical ability lacking in my Hà Nội string players is the 20th century vocabulary expanding the sound world of their instruments. Playing behind the bridge, with the wood of the bow, drawing the wood across the bow, going behind the bridge, flautando harmonics, rapid changes between these sounds, are all a foreign language. Did I mention the Bartók snap pizzicato? Francis Akos with Kate’s husband Harry Jacobs in San Francisco. So I’ve invoked our extended family link to Bartók, Kate’s father Francis, now placing his photo in my post for all to see. Because the expanded string techniques I mentioned are required by all the Vietnamese composers I’ve championed! These sounds are also used as a gateway to ancient Vietnamese instruments. So when Jan teaches my players to invest these sounds with depth and spirit and emotion, she’s reaching into her own continuity, with Eugene Lehner and Francis Akos, both personal friends of Béla Bartók. It’s a direct line. Continuity. Jan’s mindset teaching a Bartók snap is deeply personal. Her teachers were the ones to lead the way. The Kolisch Quartet performed world premieres of Schoenberg, Berg, Webern and Bartók from memory. 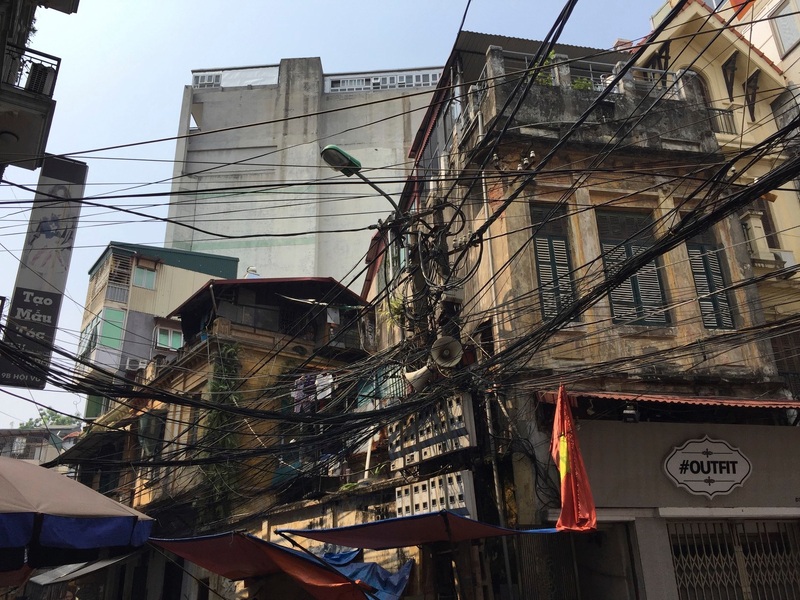 This Kolisch pedigree gives her an authority in Hà Nội, and the authority comes from her fortune with cultural continuity, something not in the Vietnamese experience. That’s part of remembering the Vietnam War as Americans, because we snapped their continuity. And you’d be right to expect that she’s achieved a sea change of perception about sound with my string players. Jan beaming at the progress of Vũ Khánh Linh after a successful performance, including many confident Bartók snaps, in Hà Nội. Another example of our continuity involves the music of Igor Stravinsky. Esa-Pekka Salonen said in an interview he’d give his left arm to spend 30 minutes with Stravinsky. Thank God I’ve never needed to be that extreme. I’ve spent a career around William Kraft. An iconic American composer, as a percussionist he recorded l’Histoire du Soldat with Stravinsky conducting and still does a great impression of Stravinsky’s voice. At 93, Bill is a living legend. 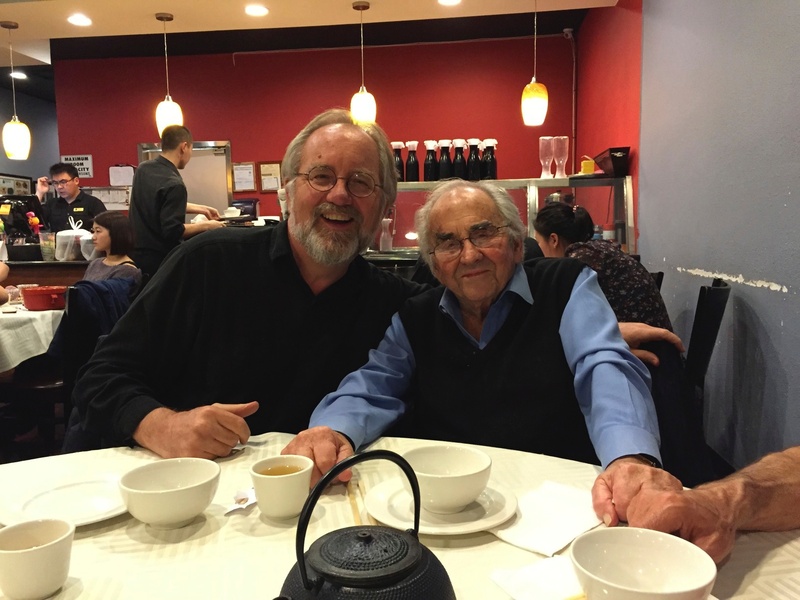 Celebrating life at the fiery Chengdu Taste in Alhambra with William Kraft. 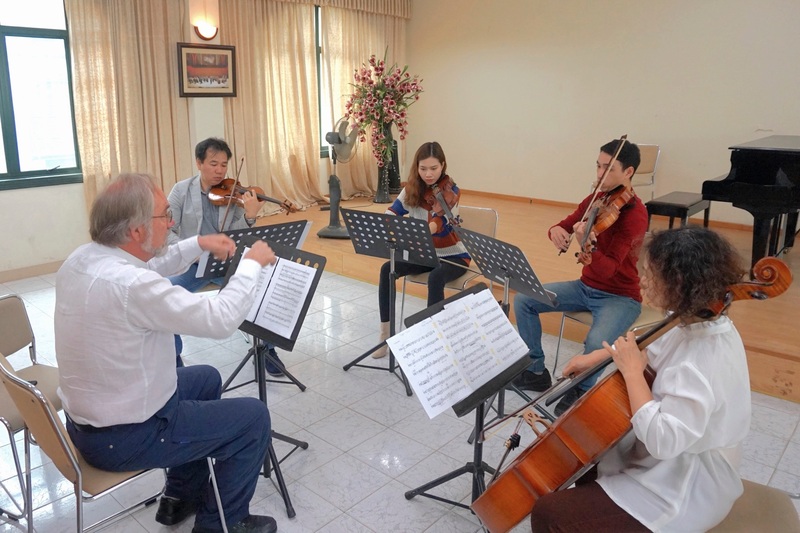 I began my post with a rehearsal photo of a new string quartet by 19 year old Vietnamese composer Nguyễn Minh Nhật, who is studying composition at the Manhattan School of Music in New York City. Nhật is an important part of my involvement in Hà Nội, as there are now three generations of composers inspiring my commitment to the Hà Nội New Music Ensemble. At 19, he is the future of new music for Việt Nam, and it’s in good hands. And we were thrilled Kraft wanted to meet him when Nhật was coming to Los Angeles to visit his aunt in Studio City. With Nguyễn Minh Nhật, his mother Hằng and Jan at Walt Disney Concert Hall in Downtown Los Angeles. We might take Stravinsky’s meter changes for granted by the 21st century, but his output is a terra incognito for my Hà Nội friends. Obviously a focus on Stravinsky is on my drawing board for the near future. They are smart and quick learners, so I’m confident they will become fluent with meter changes, work I’ve already begun. Staging l’Histoire du Soldat with a Vietnamese/American point of view gives you an idea of projects in the planning stages. And how we as Americans might reflect and find a way to remember Việt Nam. By creating continuity together. Like Jan teaching a Bartók snap pizzicato or a Schoenberg Berg Webern sul ponticello, Stravinsky is also personal for me, as William Kraft has encouraged me during my entire career. Learning how to count mixed meters from him is a permanent life lesson for my musicianship. There is no fear after absorbing Bill’s explanation of pulse. So, following my theme of continuity, I was thrilled that Nguyễn Minh Nhật would meet Kraft, at a holiday dinner that also included our best friend from México City, Ricardo Gallardo of the Tambuco Percussion Ensemble. Ricardo’s Tambuco toured in 2016 to Australia, Jakarta and Bali (where the Stradivarius of gong making lives in Indonesia), and six cities in China. They will be in Japan in the autumn of 2017 and the Mexican Ambassador to Thailand used to be their manager in México City. So there are lots of dreams forming for the future. Stay connected for our next steps! A holiday dinner connecting generations of musicians. And so my work in Việt Nam is about restoring and creating musical continuity, and I have written a few earlier blogs discussing my outreach to musicians in Paris if you are interested in learning more about the late Nguyễn Thiên Dạo, who studied with Olivier Messiaen, and the very alive Tốn Thất Tiết, who, you can see this coming, will be mentoring Nguyễn Minh Nhật soon. A simple search will guide you to those posts. And so, what about that American truth serum and Việt Nam? Language is key and vocabulary determines language. Increasing understanding comes from learning how to communicate with each other. The ultimate message of my language based truth serum for Americans about Việt Nam? We need each other. Now more than ever. Let that sink in. Continuity as 19 year old Nguyễn Minh Nhật listening to 93 year old William Kraft tell him about Igor Stravinsky, a magical holiday exchange for us all. The Vietnamese understand family. And by making our dedication to new music based on our extended family, and the first generation teachers who guided us, I think it is safe to say that we’ll be making more and more progress in the coming years. There’s a new music wave building in Southeast Asia, and it’s coming out of the Hà Nội New Music Ensemble. Because we are all taught by one thing. Continuity.